We were at the end of a 40 day period spent in Macedonia, with the official goal of writing about the U17 Women’s European Handball Championship – to promote women’s handball and a specific age category that doesn’t really get media attention, and to develop our journalistic skills as well. There were 40 of us, aged 18 to 29, coming from 17 different countries. We lived, worked and partied together. 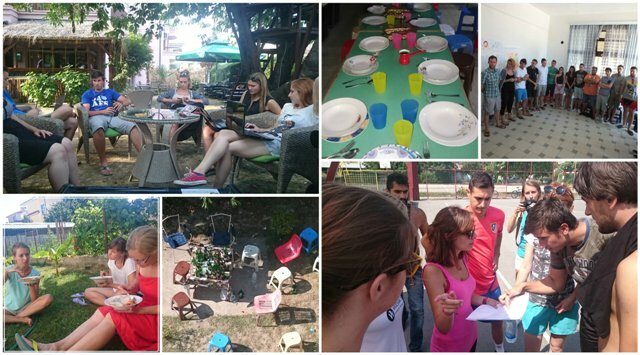 We mainly stayed in a three story house in Struga, a small town next to lake Ohrid, where we were trained, learned from each other – from the rules of handball to how to write a match report – and got used to work as a team. Then, we moved to Skopje for the tournament. Before the first match, Spain-Romania, I watched suspiciously as Pablo held high a red scarf during the national anthem. Then our anthem started playing; the girls and their coaches gathered by their shoulders, the 4-5 loud parents sitting in the stands froze and I forgot about my principles. I accepted the fact that I can’t contain myself, that this is not a place where I have to censure myself – we were the only journalists, the parents and families the only spectators and the stands quite empty – and that the reason I like sports so much is that it involves emotion. So, after the first two matches that I watched from the press box or jumping near the railing of the stands, just as Pablo showed, I went down near the court with Dan, the other Romanian in the project. Behind the player’s bench, everything is more intense. Just like in tennis, you can hear the screams on the court, the screak of sports shoes on the floor, the coaches arguing, the girls’ encouragements and their cries of pain. You wish them good luck before the game, you see their joy after every goal and their red eyes after defeats. And then you have to interview them. I wasn’t the only one who acted like a supporter. 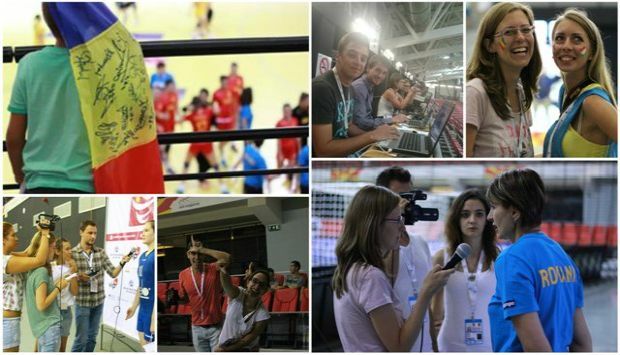 Dan hooked a Romanian flag over his laptop, Szilvia painted the Hungarian flag on her face, and Pablo and Noelia got pictures with the Spanish team and yelled “Vamos España!” These kinds of actions were encouraged by the fact that the project’s real objective – apart from our development as reporters and the coverage of the tournament – was to have an exchange of experiences and to learn about different cultures. Jovana (from Serbia): What’s on the menu? Jovana: Come on, sarma is not yours, it’s mine. And although the sporting competition reminded all of us where we came from, it managed to unite us even more. You couldn’t watch a match without thinking about those who will be happy or sad after. After the improvised newsroom meetings held in the hostel kitchen in the mornings and before we got into the cars that took us to the two arenas, we didn’t just wish good luck between us individually, but to our teams also. In the evening, when we met again in the garden, before we started writing, editing pictures or video interviews, we drank a beer for our wins or for our losses. It was hard for me to admit that beyond the joy of being close to the Romanian team and of witnessing a tournament first hand, there was something else that I liked more: to share these emotions with people that I didn’t even know three weeks before, but whom I was working with now. And it’s these moments that I will miss the most. The crowded kitchen and the food that suddenly disappeared overnight, the queue at the bathrooms, the overpopulation of the nearby bar when the Internet was down back home, the meaningless trips to the bank at the end of which we couldn’t take our money out of our accounts for obscure reasons – all kinds of national holidays or staff on vacation – the beach parties, boat party, garden parties, bonfire parties, wedding-crashing parties; the Dutch, Turkish, or Bosnian dinners, the butterflies in my stomach and the dance nights by the lake; the melting looks and the hugs we started to receive more and more over the last few days. The feeling that we were in a bubble we didn’t ever want to leave. It was a bubble because we could act like supporters. Because we could make our own rules, without editorial-commercial-financial pressures; because we were in a place and a moment in time that held no big responsibilities, but from learning and experimenting – not just with what we produced, but with ourselves too. It was a bubble because we lived everything that happened there like it was the most important thing in the world, but we can’t explain to those at home why; and because we didn’t stay there long enough for it to become hard, to start arguing or to miss home for real. PS: I’m not complaining, I know I’m lucky to have come back to a place I like and somehow, I feel like I’m still in a bubble. One that is more real.